Signed & Numbered Limited Edition 3D Artwork by. 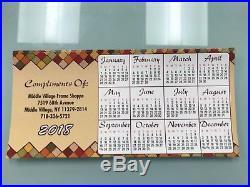 Image Size : 10" x 11 1/2" or 25.4cm x 29.21cm. Approximate Frame Size : 17" x 18" or 43.18cm x 45.72 cm. Published : 2003- Deluxe Edition # / 200. Deluxe Edition - 3 Layers - Hand Embellished with Acrylic Paint Glitter & Swarovski Crystals. A Certificate of Authenticity (COA) from Charles Fazzino included. Framed in a 2 inch Matte Black Wood Frame. Matted in a 2 inch White Acid Free Mat with a 1/4 inch Inner Red Color Acid Free Museum Mat. 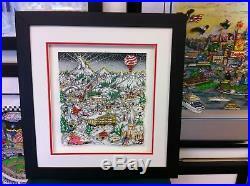 The item "Charles Fazzino 3D Artwork Ski Skate Snow Spectacular Signed & Numbered DX" is in sale since Friday, February 16, 2018. This item is in the category "Art\Mixed Media Art & Collage Art".